This time Drift is launching a new book (not a new feature) called "This Won't Scale." The book shows you how their marketing team has used unscalable tactics to drive results and become one of the most well-known marketing teams in SaaS. @hnshah Hi, the link is not working. It leads to a 404 page, a very nice one btw. Cool :) So it's a physical book? How long until I can expect it? @daviswbaer Order it today and you'll get yours next month. 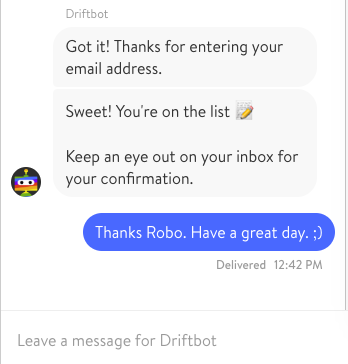 Drift is a great product. Looking forward to the new book from Drift. @matbilinski thanks for the feedback! @gaiapunk Thank you Evan, did you request a copy?